1867 Austro-Hungarian Empire is born through the Ausgleich ("the Compromise"). On June 8 Emperor Franz Josef is crowned King of Hungary. He is best known for his book The Decline of the West (Der Untergang des Abendlandes), which puts forth a cyclical theory of the rise and decline of civilizations. After Decline was published in 1918, Spengler produced his Prussianism and Socialism in 1920, in which he argued for an organic version of socialism and authoritarianism. He wrote extensively throughout World War I and the interwar period, and supported German hegemony in Europe. The National Socialists held Spengler as an intellectual precursor but he was ostracised after 1933 for his pessimism about Germany and Europe's future, his refusal to support Nazi ideas of racial superiority, and his critical work The Hour of Decision. US Navy's Transport Service During Wartime: Commander Charles C. Gill's Report: Previous to 1916 the idea of a United States overseas expeditionary force numbered by millions would have been generally regarded as a remote if not impossible contingency. Consequently no extensive peace-time preparations had been made for such an undertaking. The task of providing a transport fleet was, therefore, a pioneer work. Ships had to be obtained, officers and crews enrolled and trained. It was necessary to provide docks, storehouses, lighters and tugs, coaling equipment, repair facilities, and all the varied machinery for operating and maintaining a large transportation service. An efficient administrative organization had to be developed. Such, in brief, was the problem confronting Rear Admiral Albert Gleaves, then Commander of the Destroyer Force of the Atlantic Fleet, when, on May 29, 1917, he received orders designating him Commander of United States Convoy Operations in the Atlantic. 1934 Anti-Semitism: Poland: Zionist headquarters in Lvov (Lemberg), Poland, is bombed. 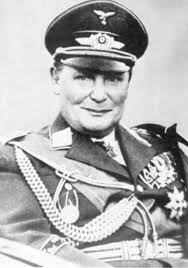 Chancellor Schuschnigg rejects Austrian union with Germany. 1. We are faced with the fact that our Ambassador in Moscow had a talk with Herr Molotov about the resumption of German-Soviet commercial negotiations and that on this occasion Herr Molotov made them subject to the clarification of political relations between Germany and Soviet Russia. Of course we ask ourselves whether Herr Molotov wanted to express thereby a desire that a talk get under way concerning the political relations between us, or whether he wanted this considered simply as a form of rejection. 2. You yourself as well as their Ambassador occasionally have indicated possibilities of some day discussing the political relations between Germany and the Soviet Union, and we ask ourselves whether this is in harmony with Molotov's views or whether we are dealing here with different points of view of their Embassy here and their Foreign Commissariat. 4. It is admittedly very doubtful whether the state of affairs in Europe just at the moment promises success from such talks, since the Soviet Government is engaged in negotiations with England, which indicate that Moscow is more or less determined to enter actively into the English policy of encirclement. However, it is, of course, up to your Government [marginal note: "ice-cold"] to judge whether at this stage in the Anglo-Soviet negotiations, it still sees room for such a conversation with Germany. The reported agreement of the Soviet Government to the sending of Cripps appears credible, since the Soviet Government has always taken the position that it was of interest to it to learn what the British Government had to tell them, and that economic agreements with England were in harmony with the neutral position of the Soviet Union. In addition, the Soviet Union is interested in obtaining rubber and tin from England in exchange for lumber. There is no reason for apprehension concerning Cripps' mission, since there is no reason to doubt the loyal attitude of the Soviet Union toward us and since the unchanged direction of Soviet policy toward England precludes damage to Germany or vital German interests. There are no indications of any kind here for belief that the latest German successes caused alarm or fear of Germany in the Soviet Government. All the assertions of the foreign and especially enemy press to the contrary are desperate attempts to sow distrust between Germany and the Soviet Union, to start a diplomatic activity against Germany at any cost in view of the precarious situation of the Allies, and to exploit this as propaganda for their own people. The selection of Cripps as British plenipotentiary appears unfortunate in view of the attitude in Moscow: the Soviet Government prefers to negotiate important matters with a prominent representative of the foreign government. As I see it here a trip by Ritter and (group garbled) at the present time would have to avoid looking like a race with Cripps. The advisability of the trip would also have to be considered from the point of view of whether we would (group missing) anything new to offer the Soviet Government. Arthur Seyss-Inquart takes office as Reich Commissioner for Holland. Dunkirk: The French allow their troops to be evacuated, even sending several ships of their own to assist. German forces capture Ostend and Ypres in Belgium and Lille in France. 1941 Holocaust: France: In Paris, thousands of foreign-born Jews are seized and interned. At the same time, thousands of Polish and German-born Jews, who had fought against the Germans in the French Foreign Legion during 1940, are deported to slave labor camps in the Sahara Desert (see March 22). On this day in 1942, on the advice of Nazi propaganda minister Joseph Goebbels, Adolf Hitler orders all Jews in occupied Paris to wear an identifying yellow star on the left side of their coats. 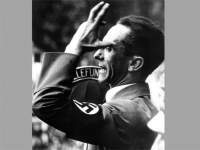 Joseph Goebbels had made the persecution, and ultimately the extermination, of Jews a personal priority from the earliest days of the war, often recording in his diary such statements as: "They are no longer people but beasts," and "[T]he Jews... are now being evacuated eastward. The procedure is pretty barbaric and is not to be described here more definitely. Not much will remain of the Jews." 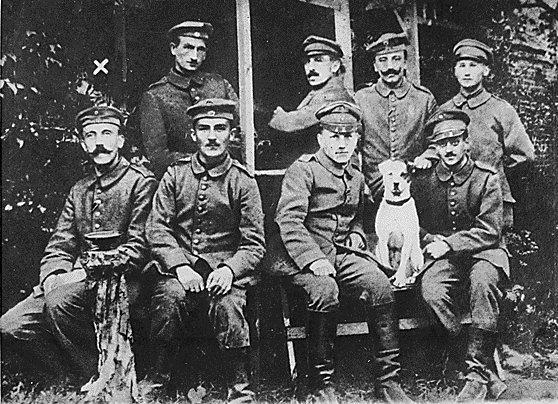 The measures may also be carried out by the German authorities, since the persons who have become resistants are to be considered as foreigners belonging to an enemy power and the members of their families are also to be considered as such. 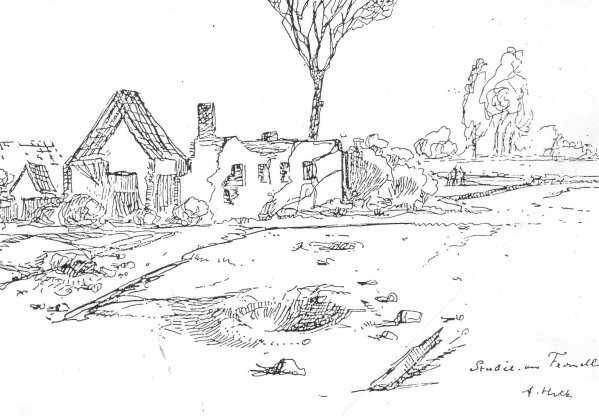 In the opinion of those present, the members of these families should be interned; the practical carrying-out of this measure and its technical possibilities must be carefully examined . . . .
We might also study the question of whether these families should be interned in regions particularly exposed to air attacks, for instance, in the vicinity of dams, or in industrial regions which are often bombed. A list of families who are considered liable for internment will be compiled in collaboration with the Embassy. It is only possible with the aid of arms to secure the lives of enemy pilots who were shot down during such attacks, for they would otherwise be killed by the sorely tried population. Who is right here? The murderers who, after their cowardly misdeeds, await a humane treatment on the part of their victims, or the victims who wish to defend themselves according to the principle: 'An eye for an eye, a tooth for a tooth'? This question is not hard to answer. It seems to us hardly possible and tolerable to use German police and soldiers against the German people when it treats murderers of children as they deserve. Hitler decides to produce the ME 262 as a fighter-bomber. Erprobungskommando 262 is formed at Lechfeld in Bavaria as a test unit to introduce the Me 262 turbojet fighter aircraft into service and train a core of pilots to fly it. In the end, slightly over 1,400 Me 262s of all versions will be produced. 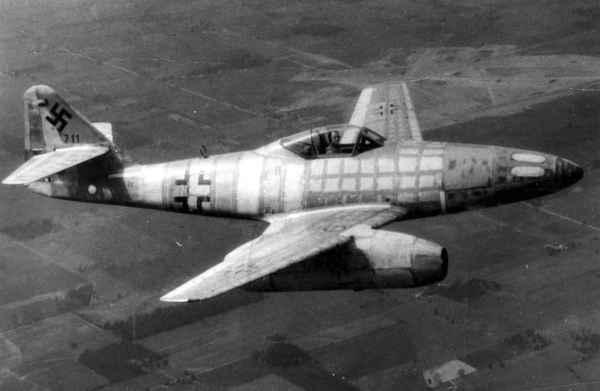 As few as 200 Me 262s will make it into combat units due to fuel shortages, pilot shortages, and the lack of airfields capable of supporting the Me 262. The first aircraft were primarily experimental ships and their engines had a lifetime of about four to five hours. Then again, they were completely new machines of which a great number had to be used for the training of pilots. Furthermore, we had to shake out the "bugs" from the engines. So that a lot of the first machines were lost through forced landings. Another thing, the ship had a kind of brake which had to be applied very carefully, otherwise it would roll off the runway and until we had corrected that, we lost a number of machines this way. It was hard to throttle it back because it was very fast. A lot of other things came into it. It was just a completely new ship and a completely new type of engine. But toward the end, everything was under control, and what was needed was a little more experience for the pilots, so that they might know how to fly this ship at its high speeds...The Fuehrer had originally directed that it be produced as a fighter, but in May, 1944, he ordered that it be converted into a fighter-bomber. This conversion was one of the main reasons for the delay in getting this plane into action in any quantity. 1945 World War II: Japan: Admiral Ozawa replaces Admiral Toyoda as commander of the Japanese Combined Fleet. During that year it had become extremely difficult for me to meet the demands of the various employers of labor represented in the Central Planning Board. At no time did I issue directives or even recommendations to "shanghai." In this conference I merely used that word as reminiscent of my days as a seaman, in order to defend myself against those who demanded workers of me, and in order to make it clear to the gentlemen how difficult my task had become, particularly in 1944. Actually, a very simple situation is at the root of this. According to German labor laws and according to my own convictions, the "Arbeitsvermittlung" (procurement of labor) — the old word for "Arbeitseinsatz" (allocation of labor) — was a right of the State; and we, myself included, scorned private methods of recruitment. In 1944 Premier Laval, the head of the French government, told me that he was also having great difficulties in carrying out the labor laws where his own workers were concerned. In view of that, and in agreement with one of my collaborators, Dr. Didier, conferences were held in the German Embassy-the witness Hildebrandt, I believe, is better able to give information about that-with the head of the collaborationist associations, that is to say, associations among the French population which advocated collaboration with Germany. During these conferences at the German Embassy these associations stated that in their opinion official recruitment in France had become very difficult. They said that they would like to take charge of that and would like to provide recruiting agents from their own ranks and also provide people from among their members who would go to Germany voluntarily. Recruitment was not to take place through official agencies but in cafes. In these cafes, of course, certain expenses would be necessary which would have to be met; and the recruiting agents would have to be paid a bonus, or be compensated by a glass of wine or some gin. That way of doing things, naturally, did not appeal to me personally; but I was in such difficulties in view of the demands put to me that I agreed, without — intending, of course, that the idea of "shanghai" with its overseas suggestions and so forth should be seriously considered. Sauckel was a short, pudgy man, bald and with a little Hitler moustache. A journalist noticed that he walked 'on the balls of his feet like a referee at a wrestling match.' Fellow defendants who were aristocrats or just plain snobs mocked his plebeian accent. His style of giving testimont was long-winded, irrelevant and personal - like Shirach's, but more so. It took an excessively long time before he could be weaned away from talking about his father's life as a postman, his mother's heart trouble, his own adventures as a seaman on a sailing ship going to Australia in 1914 and his happy life with his devoted wife and ten children. 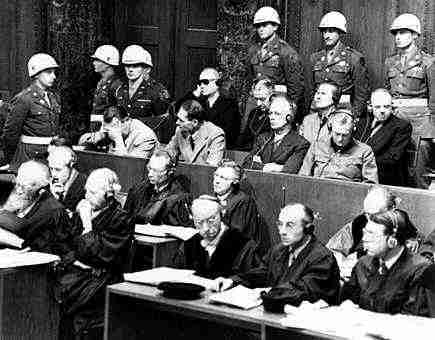 No wonder that when he began to explain his reasons for joining the Nazi Party, Lawrence (The President of the Tribunal) snapped: 'It seems to me that we are having it inflicted on us by nearly every one of the defendants. '...He claimed never to have heard of 'extermination by labor,' never to have seen letters with his typed signature, not to remember meetings he attended. All this took up three and a half days. The correspondent of the Daily Telegraph found it was 'difficult to write objectively of such a performance...of the injured innocence, sanctimonious self-justification and flat contradiction by Sauckel (of) remarks he is shown by several minutes to have made at a series of conferences but now is anxious to disclaim.' Sauckel's evasions were soon exposed, however, by an effective cross-examination by the French counsel, Herzog. 1946 Post-war: The British and Americans agree to end the taking of war reparations from their zones in Germany and agree to unite their administrations to share costs; the first definitive step toward the creation of a divided Germany. Some 35 U.S. states declare it to be Bob Hope Day on this day in 2003, when the iconic comedic actor and entertainer turns 100 years old. In a public ceremony held in Hollywood, city officials renamed the intersection of Hollywood Boulevard and Vine Avenue—famous for its historic buildings and as a central point on the Hollywood Walk of Fame—Bob Hope Square. Several 1940s-era U.S. planes flew overhead as part of an air show honoring Hope's longtime role as an entertainer of U.S. armed forces all over the world. Hope, who was then suffering from failing eyesight and hearing and had not been seen in public for three years, was too ill to attend the public ceremonies. Three of his children attended the naming ceremony, along with some of his younger show-business colleagues, including Mickey Rooney. One of the leading talents on the vaudeville scene by the 1930s, the London-born, American-raised Hope met his future wife (of nearly seven decades), the nightclub singer Dolores Reade, while he was performing on Broadway in the musical Roberta. They married in 1934, and four years later Hope launched his own radio program, The Bob Hope Show, which would run for the next 18 years. One of the country's most popular comics, Hope had a successful film career largely thanks to the series of seven "Road" movies he made with Bing Crosby and Dorothy Lamour . . . . In 1941, after America's entrance into World War II, Hope began performing for U.S. troops abroad; he would play shows for more than a million American servicemen by 1953. Some 65 million people watched him perform for troops in Vietnam on Christmas Eve in 1966, in his largest broadcast. Hope also became a legend for his countless TV specials, which he would perform over the course of some five decades. He hosted the Academy Awards ceremony a total of 18 times, more than any other Oscars host. 2004 USA: A memorial to America's World War II veterans is dedicated on the National Mall in Washington, DC. 2005 Europe: French electorate firmly reject the European Union's proposed constitution.